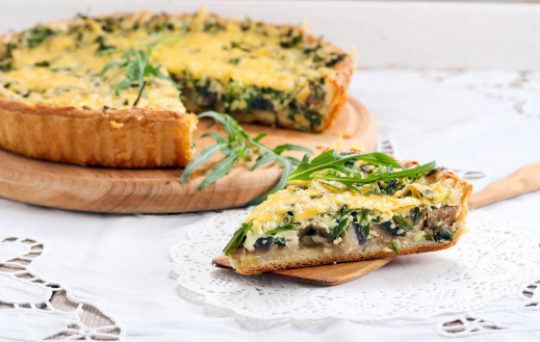 This quick, easy and elegant quiche is ideal for guests or a dinner with your family. Even better: compare this to a traditional quiche, which is over 500 calories and 40 grams of fat, in a single slice. You’ll never eat store-bought quiche again! Thank you to the Cleveland Clinic Healthy Heart Cookbook. Line a tart pan with the pie crust. Coat a nonstick skillet with cooking spray. Preheat over medium heat and add the shallots. Sauté, stirring, for 3 minutes and then add the asparagus and mushrooms. Cook over medium-low heat for about 8 minutes. Place the vegetables in the unbaked crust. In a small bowl, whisk together the milk and egg substitute. Pour over the vegetables. Sprinkle with the cheese, thyme and oregano. Press gently with the back of a spoon to incorporate into the egg mixture. Top with the tomato, salt (if using), and pepper. Bake for 25 to 30 minutes, until set. Remove from the oven and let rest for 5 minutes. Serve immediately.